FREE! But must RSVP to attend. Visit the website, Facebook, and join our newsletter for info on when the next Interactive Screening will be held. Autism Society of Greater Phoenix will host BE SAFE Interactive Screenings throughout Arizona, bringing local police officers and young people with autism together to learn from one another. Officers from many different local police departments will be paired with teens/adults with autism to mentor them and learn from them. 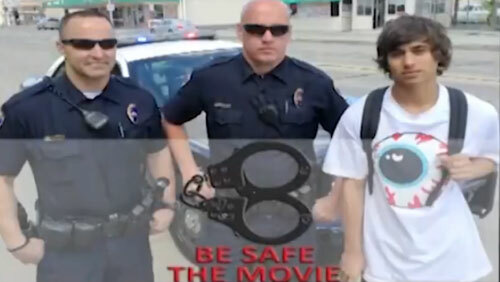 After watching each BE SAFE movie scene, police officers will help the young people learn and practice four life-saving skills: 1) Stay where you are when you meet the police; 2) Do what the police tell you to do; 3) Show your empty hands to the police; 4) Don’t touch an officer or his/her equipment. Teaching safe behaviors directly and explicitly to individuals with special learning needs is essential for promoting safety for themselves and others. One in 59 children is now diagnosed with autism. Children with autism are growing up and participating in community life more than ever before, with an estimated 50,000 kids with autism turning 18 each year. Even when the police are trained or know that someone has a disability, things can still go wrong if the person with a disability is unprepared for a police encounter. Their first instinctive reaction might be a “fight or flight” response, especially if the person is unfamiliar with the police or their procedures. This event will help teens and adults with autism and related conditions become prepared for all different kinds of police encounters, ranging from asking for help, to being detained as a suspect. Officers will have the chance to interact with special needs individuals in the communities they serve. This event is an opportunity to see local officers at their best and witness relationships being built that bridge the gap between police and the autism community. The BE SAFE event is positive, uplifting, and has the potential to save lives. It is a worthwhile opportunity to shine the light on people coming together to promote the safety of some of our most vulnerable citizens. Shannon talks to Emily Iland about “Be Safe The Movie,” a unique video modeling DVD that teaches youth with autism and similar disabilities how to interact safely with the police. Professional ‘Be Safe’ curriculum training for parents and teachers and Interactive Screenings with local law enforcement and youth with disabilities are available as well! A Phoenix-area incident last year drove home the need to continue training first responders on interacting with people with autism and other developmental disabilities. Someone on the Autism spectrum may run, fight or shut down out of fear during an encounter with police. If the officer is not educated about disabilities, it can be a recipe for disaster. When it comes to autism, there is no one formula to spot it. There is no list of characteristics that fit the bill each time. And while autism awareness is spreading, there are still places it can reach further, for example, law enforcement. Now one department has turned a misjudged and highly publicized incident into an opportunity to learn. There needs to be more training of police officers. We certainly want to encourage law enforcement to have more training on autism. However, we also believe that training people with disabilities to BE SAFE with law enforcement is another way to ensure our people with autism are safer in our community.